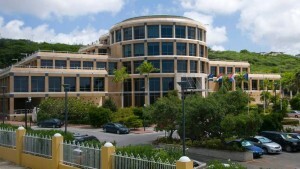 WILLEMSTAD - In its most recent Quarterly Bulletin, the Centrale Bank van Curaçao en Sint Maarten notes that the Curaçao economy recorded a real GDP contraction of 1.4% during the third quarter of 2017 compared to the third quarter of 2016. According to the Bank, the contraction was due to a decline in domestic demand because net foreign demand expanded. The Bank’s analysis by sector shows that the decline in real GDP was attributable largely to contractions in the manufacturing, transport, storage & communication, wholesale & retail trade, restaurants & hotels, and financial intermediation sectors. The contraction in the manufacturing sector was caused primarily by lower production at the Isla refinery. The transport, storage, & communication sector performed poorly because both air transportation and harbor activities dropped. Airport-related activities went down on the back of the reduction in flights by domestic carrier InselAir due to its financial headwinds. Meanwhile, the harbor recorded a decline in the number of ships piloted into the port and in cargo and container movements. The negative outcome in the wholesale & retail trade sector resulted from lower domestic and tourism spending combined with fewer activities at the free zone. Furthermore, the Bank adds that real value added dropped in the restaurants & hotels sector as a result of a decline in stay-over tourism in all the main markets. The disappointing performance of stay-over tourism was related to, among other things, the cancellation of the Curaçao North Sea Jazz Festival in September 2017 that traditionally attracts many tourists. In contrast, cruise tourism benefitted from the opening of the second megapier and the changes of itineraries by some cruise lines because of the devastation caused by hurricanes Irma and Maria in popular destinations in the Caribbean. Meanwhile, the activities in the financial intermediation sector dropped because of negative contributions by both the domestic and international financial services sectors. By contrast, output rose in the construction and utilities sectors. Growth in the construction sector was less pronounced, however, than in the third quarter of 2016 as the construction of the second megapier and the hospital were reaching their final stages. The positive results in the utilities sector reflected an increase in both electricity and water production. Finally, the Bank states in the quarterly report that over the last decade, the economy of Curaçao performed poorly, with real GDP increasing by a mere 0.1% on average per year. Furthermore, real GDP per capita has dropped by approximately 10%. An important lesson learnt is that fiscal discipline and strict adherence to budgetary rules alone will not lead to growth. Furthermore, although public investments, such as the construction of a new hospital and the upgrading of the road infrastructure, contribute positively to real GDP growth in the short term, they do not lead to higher economic growth. Curaçao cannot depend on the government alone or on incidental factors to reach a higher growth path and thereby social-economic progress. What is needed is an approach wherein the government creates the macro-economic conditions that trigger private investments. Therefore, it is crucial for the government to implement structural reforms to improve Curaçao’s competitiveness and investment climate in close consultation with all stakeholders. Meanwhile, the private sector should take a more proactive role in identifying market opportunities and developing innovative responses to those opportunities.